MANILA, Philippines - Korean boy band 2PM will be holding their first ever concert in the Philippines in March. JYP Entertainment announced that the 2PM Live Tour 2013: "What Time Is It?" will be held on March 2 at the Mall of Asia Arena. Organized by CJ E&M's MLive, Hoopla and Big Daddy, the one-night-only concert will showcase 2PM members Taecyeon, Jun.K, Nichkhun, Wooyoung, Chansung and Junho. 2PM will hold the concert in Manila after their "Legend of 2PM" Arena Tour in Japan. Manila will be the first stop of the 2PM Live Tour 2013. After Manila, 2PM will hold the concert in at the Guangzhou Gymnasium in Guangzhou, China, on March 30 and at the Impact Arena in Bangkok, Thailand, on April 8. Fans can start buying tickets for the Manila concert on Jan. 26 atwww.smtickets.com, according to JYP Entertainment. 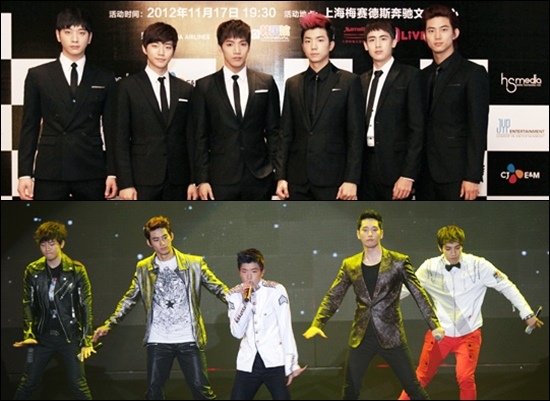 Besides the concert tours, 2PM will be coming back to the K-pop scene with a new Korean album this year. The group's last Korean album, "Hands Up," was released in 2011. In addition, 2PM will also release their second Japanese album, "Legend of 2PM," on Feb. 13. The last two years saw 2PM promoting outside South Korea particularly in Japan, where they made their debut in 2011. Recently, Oricon music chart chose the boy band's 2PM Live 2012 Six Beautiful Days as one of the best concerts in Japan last year. Last year, 2PM won the New Artist of the Year and Best New Artist in Asia at the 26th Japan Gold Disc Award. 2PM also bagged the Best Group Video award at the MTV Video Music Awards Japan in June last year. The group won the grand prize at the Tower Records K-pop Lovers! Awards 2012. 2PM's fourth Japanese single "Beautiful," released in June last year, set a record at Tower Records in Shibuya, Japan, for garnering the highest sales. "Beautiful" was certified gold by the Recording Industry Association of Japan (RIAJ) for selling 100,000 copies.